How Many Of These Hidden Spots In Mumbai Have You Visited? Most of us know a Mumbai that oozes, glamour, history, culture and finance – all rolled in one, and each of us knows bits and fragments that this city stands for. For those of us who have made Mumbai our home for many years, we assume we know most back alleys and streets this city has to offer, but we’ve just scratched the surface. This bubbling metropolis is home to places and experiences that not all of us know of yet. Take a look at some places we didn’t know too well. Mumbai has a 66-million-year old secret that’s located in the heart of the city, a rock formation known as Gilbert Hill made up of frozen molten lava. Similar vertical columns exist only in two other places in the world. With a height of 200 feet, it offers you a spectacular view of Andheri and Mumbai. What To See: If you climb up the hill, you’ll see two temples – one dedicated to Gaondevi and the other dedicated to Durgamata. LBB Tip: Make sure to carry your camera when you climb up and take some awesome panoramic shots. Bang opposite Dharavi is this wooded haven that’s home to indigenous flora and fauna, with about fourteen thousand trees, 300 varieties of plants and over a 100 varieties of migratory birds, insects, reptiles and mammals. This 40-acre park was earlier a dumping ground and in 1977, the MMRDA decided to convert it into a mini forest in the city. You can walk from one end to the other and the deeper you move in, you’ll get to hear birds chirping in the cool shade of the trees. What To See: If you go there earlier in the morning, you’ll see laughing doves, black kites, great egrets, blue throats and other migratory birds. You’ll also get to see flora and butterflies are always around them. You’ll also find fruit bats and striped squirrels. LBB Tip: Make sure to wear closed footwear and watch out for snakes. In the midst of the concrete jungle and high-rise luxury apartments in Mumbai’s iconic Malabar Hills lies a piece of history in the form of the Banganga Tank. This freshwater tank, along with the Walkeshwar temple was built in 1127 AD. Calm, peaceful and the air thick with the smell of the sea, the tank can be reached by walking down one of the many by-lanes from the main road. A rectangular tank surrounded by steps on all four sides and its banks surrounded by smaller temples and houses, you’ll find yourself surrounded by people chanting and following their daily religious rituals. What To See: It’s now a popular spot for artists, poets, musicians and filmmakers. It’s an interesting piece of history that’s close to the sea, with ducks and other migratory birds frequenting the place. Apart from this, you can also visit the Jain temple, Priyadarshini Park and Hanging Gardens that are close by. LBB Tip: We’d suggest you don’t step into the water but just admire the place sitting on the steps. 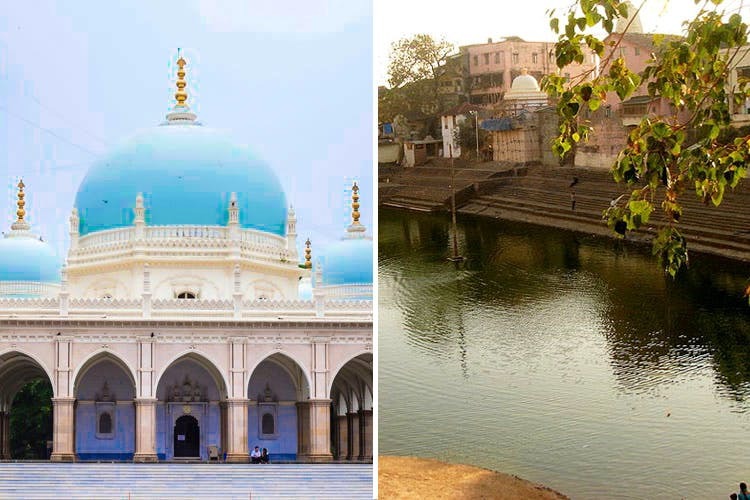 Known as Mumbai’s very own Taj Mahal, Hasnabad Dargah is one of the prettiest mausoleums in the city, made of blue and white stones with two minarets and a blue dome. It’s located in Mazgaon, one of the seven islands that made Mumbai, and was built to house the tomb of the 1st Aga Khani, Shah Hasan Ali Shah, who came to India from Iran in the early 1800s. What To See: The monument is illuminated after sunset, so that’s a sight for sore eyes for any visitor. LBB Tip: Don’t forget to get a glimpse of the top of the mosque and inside the mosque that’s made of real gold. While there are talks of the place not being open to the public, even a glimpse of it from outside is enough to ring you some peace. This last option is one for the books – Flora, one of the oldest Chinese restaurants in the city, has been in one location for several decades. As soon as you enter, you’ll feel like you’ve been transported to some fancy yesteryear food joint in China, with Chinese vases, plates, paintings and lampshades that form a part of their decor. The waiters have been around for a long time there, and are friendly and helpful when it comes to making the right selection. Located in Worli, parking is going to be a challenge, but trust us when we tell you that it’s well worth a visit.